1. Any information provided by this website is intended for information and educational purposes only; is not intended to establish any professional provider to patient relationship; and is not a substitute for the professional advice and consultation that would be obtained in a visit or call to a health care professional If you have any questions regarding a medical condition, please contact your physician or health care provider. 2. 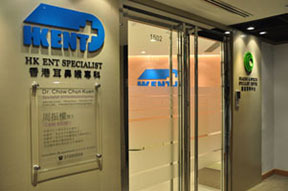 The Hong Kong ENT Specialist Ltd. will not intentionally share any information you provide us through this website with any other party without your consent. Although we will try our best to keep your privacy, we cannot provide any assurance that visitor information provided to our site cannot or will not be accessed or known by a third party who might hack into our site. We would encourage you to not provide any confidential or private information about you or your health status on this website. Because of the nature of electronic communication, we are unable to totally safeguard the information from intentional or accidental disclosure and the site is provided without express or implied guarantee. 3. This website may contain links to third party websites for your convenience. Although we try to link only to those sites that share our high standards and respect for privacy, we take no responsibility for the content or information contained on those sites, and does not exert any editorial or other control over those sites. Inclusion of those sites by links does not imply any endorsement of the material or information on the other sites. 4. You may view this web site and its contents using your web browser and electronically copy and print hard copies of parts of this web site solely for your personal, non-commercial use. Any other use, including the reproduction, modification, distribution, transmission, and display of the content of this web site is strictly prohibited. 5. The Hong Kong ENT Specialist Ltd. cannot guarantee that any file or program available for download or execution from this site is free from viruses or other conditions which could damage or interfere with your data, hardware, or software. By using this site, you agree to assume all risk for the use of all programs and files contained on this site. You agree to release the Hong Kong ENT Specialist Ltd. from any and all legal responsibility for all consequences associate with the use of this site. 6. You agree that your access to and use of this site is subject to these terms and conditions and all applicable laws in Hong Kong, and that you are using it at your own risk. This web site and its contents are provided to you on an "as is" basis. We do not provide any assurances as to the accuracy or completeness of the information available at or through this site. Although we try our best to provide information as accurate as possible, this site may contain errors and may not be complete. The Hong Kong ENT Specialist Ltd. expressly disclaims any representation or warranty, express or implied, concerning the accuracy or completeness of the information. Persons accessing this information assume full responsibility for the use of the information and understand and agree that we are not responsible or liable for any claim, loss, or damage arising from the use of the information.